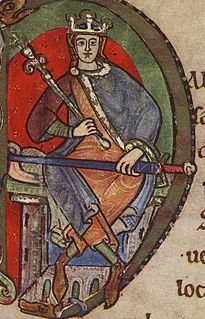 Donald III (Medieval Gaelic: Domnall mac Donnchada; Modern Gaelic: Dòmhnall mac Dhonnchaidh), and nicknamed "Donald the Fair" or "Donald the White" (Medieval Gaelic:"Domnall Bán", anglicised as Donald Bane/Bain or Donalbane/Donalbain), (c. 1032–1099) was King of Scots from 1093–1094 and 1094–1097. Donald was born in 1032, during the reign of his great-grandfather King Malcolm II. He was the second known son of the King's grandson, Duncan. Malcolm died when Donald was a baby, at age 80, and Donald's father became king. King Duncan I however, perished in 1040 when Donald was still a boy, killed by Thane Macbeth, yet another grandson of King Malcolm II, who usurped his place as king. Following his father's death, Donald went into hiding in Ireland for 17 years, for fear that he would be killed by Macbeth. His elder brother, Malcolm, went to England. It was during this time that Malcolm's grandfather, Crinan of Dunkeld, who was married to Malcolm II's daughter, was killed fighting Macbeth. When Malcolm grew to manhood, he overthrew Macbeth and became the new king. Donald was 25 years old at that time. Donald resumed power, probably with Edmund as his designated heir. Donald was an elderly man by then, at around 62 years old, and without any known sons, so that an heir was clearly required. 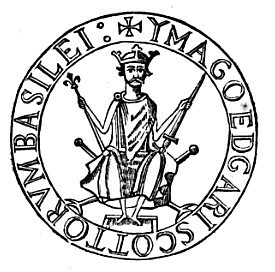 William of Malmesbury says that Edmund bargained "for half the kingdom", suggesting that Donald granted his nephew an appanage to rule. Edgar, eldest surviving son of Malcolm and Margaret, obtained the support of William Rufus, although other matters delayed Edgar's return on the coat-tails of an English army led by his uncle Edgar Ætheling. Donald's fate is not entirely clear. William of Malmesbury tells us that he was "slain by the craftiness of David [the later David I] ... and by the strength of William [Rufus]". The Anglo-Saxon Chronicle says of Donald that he was expelled, while the Annals of Tigernach have him blinded by his brother. John of Fordun, following the king-lists, writes that Donald was "blinded, and doomed to eternal imprisonment" by Edgar. The place of his imprisonment was said to be Rescobie, by Forfar, in Angus. The old ex-king would die at the age of 67 in 1099, in prison. The sources differ as to whether Donald was first buried at Dunfermline Abbey or Dunkeld Cathedral, but agree that his remains were later moved to Iona. Donald left one daughter but no sons. His daughter Bethoc married Uctred (or Hadrian) de Tyndale, Lord of Tyndale. Bethoc's daughter, Hextilda, married Richard Comyn, Justiciar of Lothian. 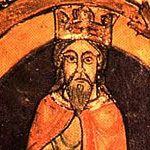 The claims of John II Comyn, Lord of Badenoch to the crown in the Great Cause came from Donald through Bethóc and Hextilda. Ladhmann son of Domnall, "grandson of the King of Scots" who died in 1116, might have been a son of Donald. He may equally have been a son of Domnall, son of Máel Coluim who died in 1085, who may in turn have been a son of Malcolm III or of Máel Coluim mac Maíl Brigti, Mormaer of Moray. Bethoc's second husband was Radulf of Nithsdale. ^ Annals of Ulster, s.a. 1116; McDonald, p. 23.